Welcome to the Fitness Tip of the Month. Each month I will discuss various aspects of fitness with the goal of helping you become a healthier and happier person. Topic will vary but the emphasis will always be on MOTIVATION. Self motivation is the reason you get out of bed at 5:00 A.M., submit yourself to constant encouragement of your fitness instructor, eat all those veggies and drink all that water. You have undoubtedly been exposed to countless seminars, courses and lectures about motivation. The fact is, most motivation comes from within each individual, not from external forces. By living many of the behaviors outlined in your personal vision, you can create an environment where self-motivation becomes a reality. So the next time you want to blame everyone else for your not reaching your goals, make sure you start by looking in the mirror. Share your personal vision for yourself with your Fitness instructor and don’t give up. You must drink a total of 8 glasses of water per day. This is too much for some and not enough for others. One should drink water based on one's individual activity level and body weight. Generally, it is good to drink half your body weight in ounces of water. The more caffeine and alcohol you drink, the more water you need. Do a urine check to determine your hydration level. If you urine is not clear, you may be dehydrated. Please take into account that vitamins consumption can discolor urine. Remember the long days of summer when you enjoyed sunlight well into the evening? Those days will return soon. Until then, you'll need to make the best of winter's darkness, but don't be alarmed if you occasionally get the blues. Experts say mild depression caused by winter's lack of daylight is quite common. 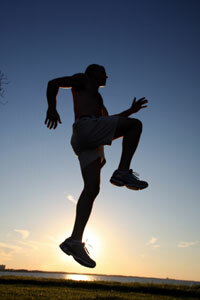 Exercise regularly - many people find regular exercise helps enormously in fending off the blues. Avoid loading up on sweets and starches. Substitute with vegetables or fruit when possible. Gaining weight over the winter only leads to eroding morale even further. Make a list of things you enjoy - like reading a novel, or walking in the park. Make a point of enjoying at least one item from the list the following day. Make a similar list of things to give you a feeling of accomplishment. Then accomplish one of them. It doesn't have to a big deal - just something that gives you a sense of accomplishment later, which tends to cheer you up. When you luck into a bright and sunny day in the dead of winter, make every effort to get outside and drink in the sunshine. Even an hour will help you fight the winter blues.